The surface of Europa. Sulfur-rich materials there are concentrated along geological features and may reflect the composition of the subsurface ocean. Image from the Solid-State Imaging instrument onboard Galileo. Extraordinarily rare springs high above the rest of the world inthe Arctic couldserve as Earth's own little version of Europa, helping scientists picture what life might face on the mysterious Jovian moon. 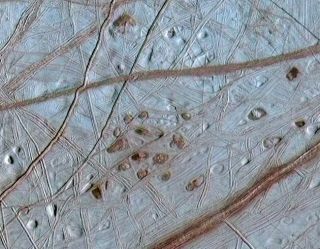 Europa is covered with sulfur-richmaterials concentrated along cracks and ridges on its icy surface, whichcould hold the only clues we currently have about the composition of its hiddenunderground ocean. These compounds in the ice might even contain organicmaterial that migrated upward from the sea below. "Europa's liquid water layer contains twice the volume of allthe Earth's oceans combined, an enormous potentially habitable environment, notbillions of years in the past but at the present day," said astrobiologistDamhnait Gleeson at NASA's Jet Propulsion Laboratory. "The composition of the ocean directly controls our view of thehabitability of the environment, our understanding of whether microbial lifecould survive there, and if so, what metabolic pathways or geochemicalgradients it could utilize to gain energy." The Galileospace probe's spectrometers captured near-infrared signals from Europa ? a"spectral fingerprint" that could help identify what these substancesare, just as a specific mix of colors might help identify a painting. However,so far it remains uncertain what exact blend of compounds matches up with thisfingerprint. To help identify the mystery compounds on Europa, Gleeson and hercolleagues investigated potential copycats here on Earth. Combinations ofsulfur-rich springs and glacial ice are very rare on Earth, but the researchersfound one at Ellesmere Island in the Canadian High Arctic, where springs at the Borup Fiord Pass stain the surrounding glacier yellow with sulfur, gypsumand calcite. "We're pretty limited when we're looking for terrestrialanalogs of something like Europa,since the environments are so different, but the site they found is probably asclose to something as we're going to find," said geologist Ed Cloutis atthe University of Winnipeg, who researches Mars analogs. In a two-week expedition to the site in the summer of 2006, theresearchers analyzed samples from these springs in near-freezing temperatureswith backpack spectrometers, flown to the valley in a small plane and shuttledout to their camp by helicopter. "The first three days it rained non-stop, but after that itcleared up nicely -- much to our relief -- and I was able to haul myspectrometer up to the glacier," Gleeson recalled. "I'm not sure howmuch the spectrometer weighed on my back ? it was 70 pounds in the box ? butall I know is that when I lost my balance while wading through waist deep snowwith it on, it was close to impossible to get up again. Entertaining for theothers to watch me, though." The scientists not only examined samples out in the field, butalso investigated how these materials appear at different scales, from orbitalremotely-sensed data to high-resolution laboratory analysis. The spectralproperties of the glacial ice proved similar to those of materials seen onEuropa. "These results represent the first data on the detection ofsulfur minerals on ice in a terrestrial setting," Gleeson said. "These new data improve our ability to correctly identify these mineralsin other locations." Minor constituents of the glacial ice seen through lab analysis,such as gypsum and calcite, went partially or completely undetected insatellite data, findings that must be taken account when interpreting spectracollected during planetary missions, Gleeson said. "Technology under development for future missionscould benefit from field-testing in this Europa-relevant environment," shenoted. This arctic location is not a perfect analog for Europa ? thetemperatures at the pass are higher, the radiation is far lower, and oxygen iseverywhere, influencing the chemistry. Collecting spectra of the arcticmaterials under very low temperatures could make them more useful as Europaanalogs, Gleeson noted, while subjecting them to radiation could help determinewhether they represent likely precursors to Europa's non-ice materials. Any mission to determine the potential habitability of Europarequires spacecraft that can both operate independently of Earth, given theincredible distances involved, and spot ideal places on the surface to explore. If there is lifeon Europa, this arctic site could give vital clues as to what to focus onwith the limited resources any probe sent there would have. "Wecan take a look at whether and what kind of biology can survive on that island,which is one of the nastier environments around,"said Cloutis, who did not take part in this study. "Seeing how lifesurvives and how biology interacts with the geology gives clues to what to lookfor in Europa." The findings of the Borup Fiord Pass expedition were detailed onlineMarch 6 in the journal Remote Sensing of Environment.